I am keeping the focus on my Star Light Star Bright quilt. I am using 12 of the sixteen blocks in this top. The rows are complete, and I am adding the sashing to finish it off. It will be on the small side of the QOV requirements, but I am sure one of our veterans will enjoy it as a lap quilt. 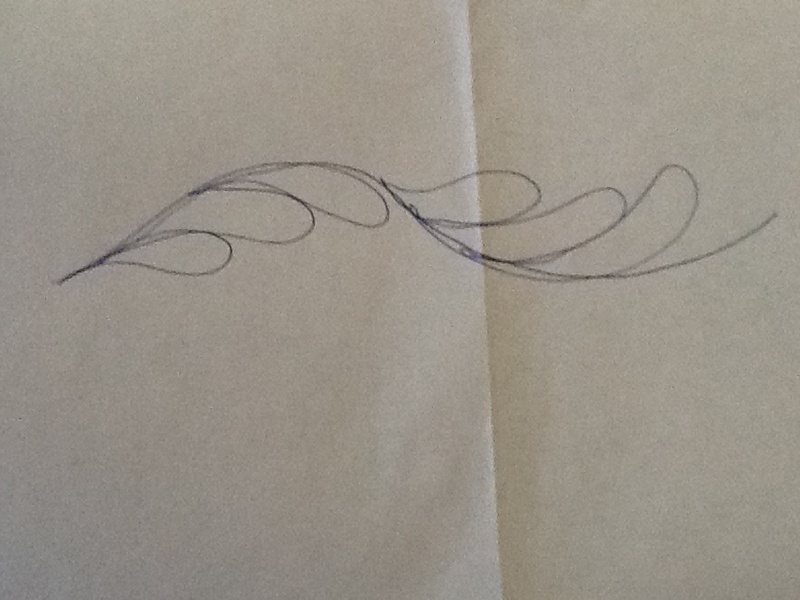 I have a pantograph in mind when it comes time to quilt. I am loving my Dark Side of the Moon rainbow yarn! I did go up to size US4 needles. There is good stitch definition and it’s not too lacy. It will be fun to wear this with a variety of solid color tops. A few weeks ago, Steph Pearl McPhee was knitting a sock, a common occurence which she chronicles on her blog The Yarn Harlot. 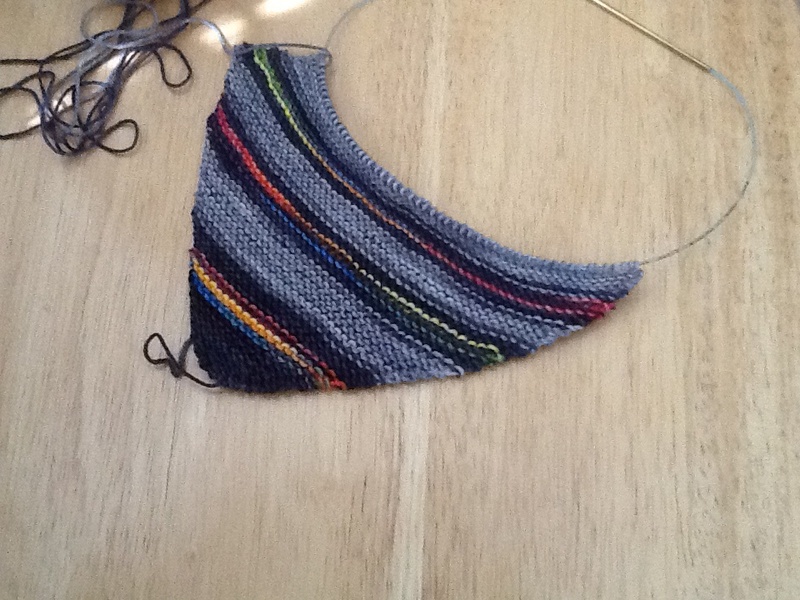 I was immediately smitten with the yarn, which made perfect rainbow stripes. Smitten enough that I scrolled through the comments until I found a clue about the yarn dyer and where to purchase this fabulous colorway. The yarn is called Perfect Sock from Must. Stash. 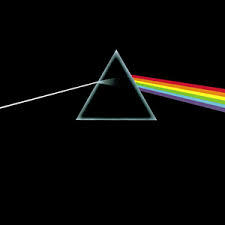 Yarn and the colorway is “Dark Side of the Moon,” inspired by the classic Pink Floyd album cover. Must. Stash. Yarn was taking pre-orders for a new batch of this colorway, and I happily made my purchase, then started searching for a pattern. My sock knitting phase is over, since I never actually wear the socks I’ve made. Plus, this yarn is too pretty to hide in a shoe. So, I settled on a scarf, the Diagonal Garter Stitch Scarf, to be exact. I did not want an intricate pattern to compete with the beautiful yarn. My order arrived yesterday and I cast on right away. It’s so pretty in the cake! If you choose to make socks, the skein is nicely divided into 2 hanks so that the stripes will match. 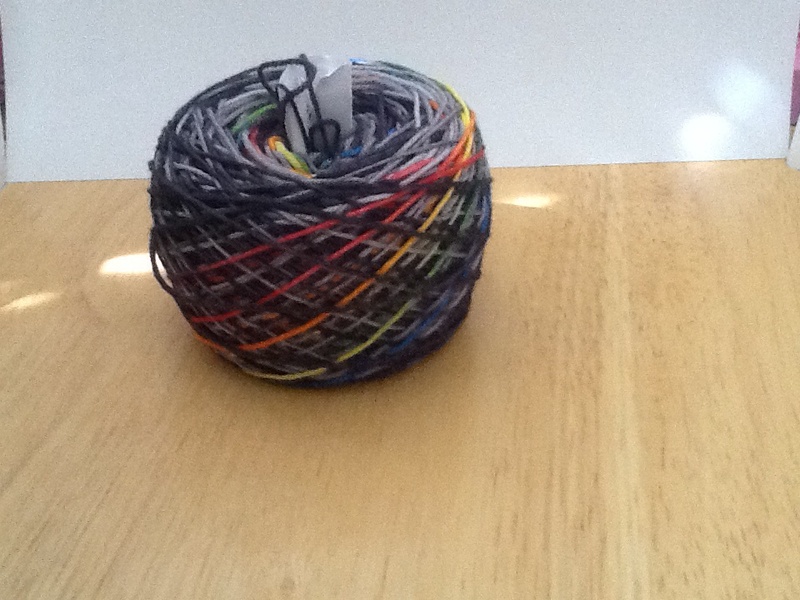 Since this is fairly thin sock yarn, I cast on with US1 needles, and now I am worried that I will run out of yarn. Yes, these are the worries of a knitter, even with only 8% of the project finished! I think I will use the second cake to start on larger needles and compare. I like the fabric that I am getting so far…I don’t want anything real lacy, but we’ll see how it turns out. 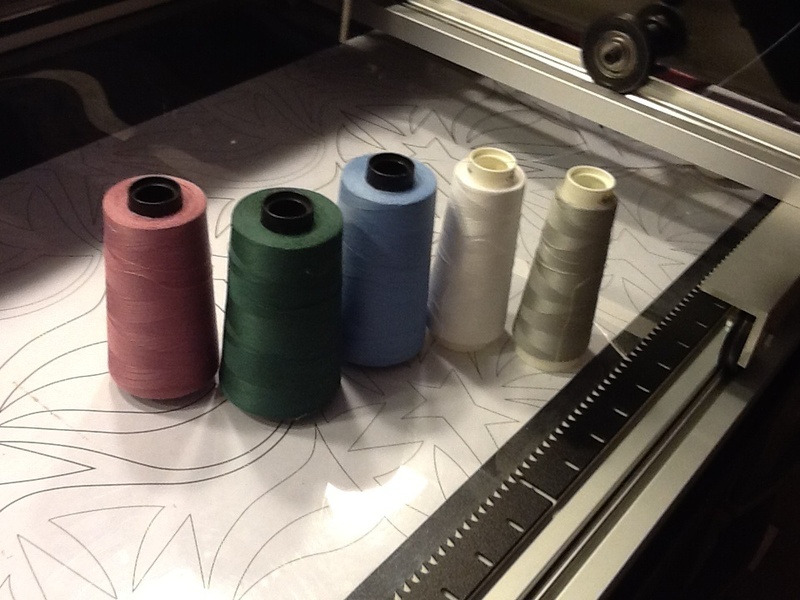 I will match thread to fabric. 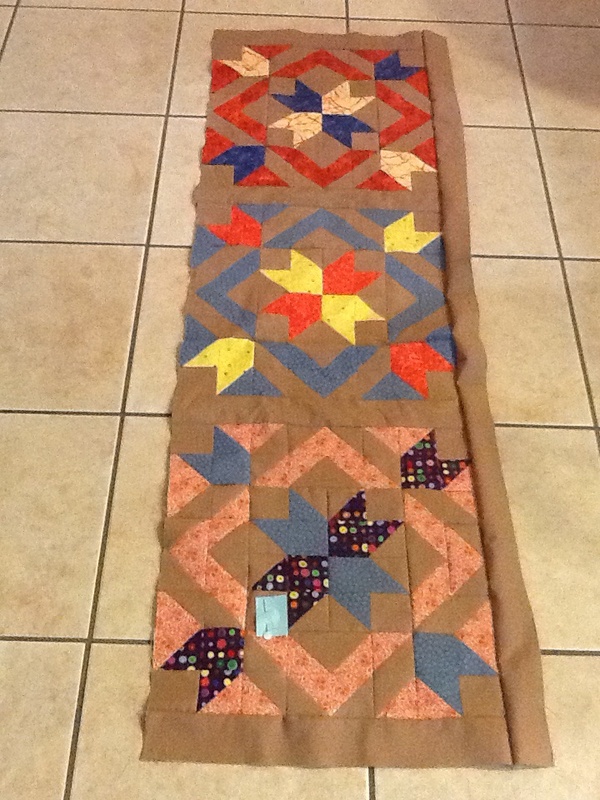 The outer border is blue, so that is what I started with. I am stitching a simple feather in the blue border, and swirls in the blue squares. I am also stitching in the ditch around all the blue pieces. 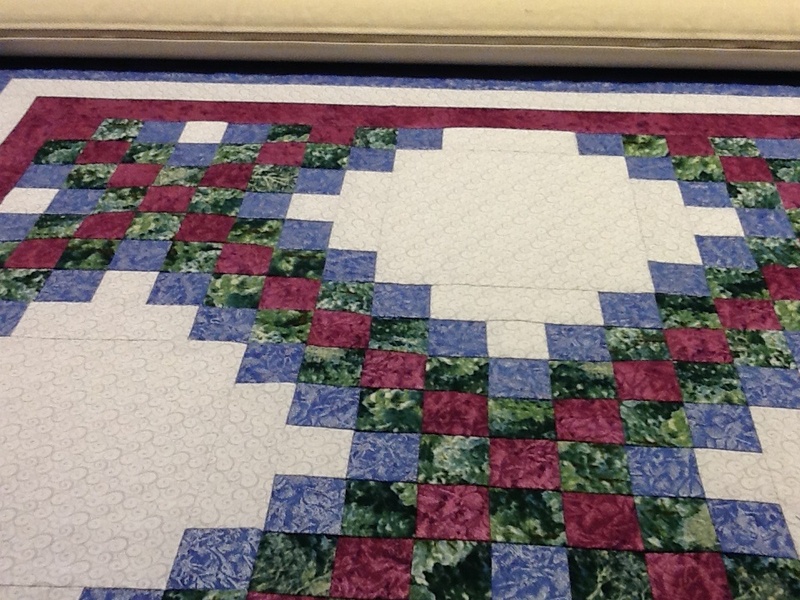 (Another WWFM choice…some quilters hate stitch in the ditch! I am not perfect with my stitching lines, sometimes they jump out of the ditch, but it does help to secure the top.) I will work from top to bottom, stitching everything that needs blue thread, then I will change to purple and work back up. I am saving the white and grey section for last. If you noticed from the thread picture, I am kind of low on those colors. My initial thought is to use the grey, just so the quilting can be seen. I will start with the center designs, and then if I run out I can finish the outer squares with the white. I am going to quilt the married couple’s names and wedding date in the center, and then some personal emblems, and the out squares might have heart or circular feather wreaths. Have I mentioned The Fiber Factor? It is a knitting reality show that I heard about a few weeks ago. 12 knit designers were chosen to compete in several challenges over the rest of the year. They usually get about 3 weeks to design and knit their projects. Friday June 28 will be the announcement of the Round 2 winner, and next week they will start on Challenge #3. The contest is sponsored by Skacel, a yarn and needle distributor, most well-know for Addi needles. 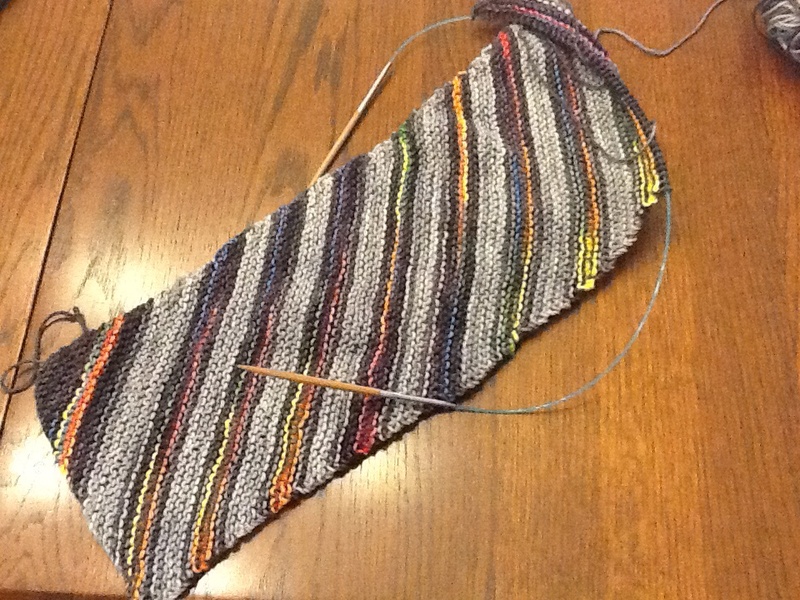 Challenge #1 was “Knit your Life.” One of the designers, Rachel of Remily Knits, made a shawl called “Evolution” that progresses from a garter stitch beginning to cables and intricate lace borders. She has graciously offered her pattern for free and is hosting a knit-along on Ravelry. 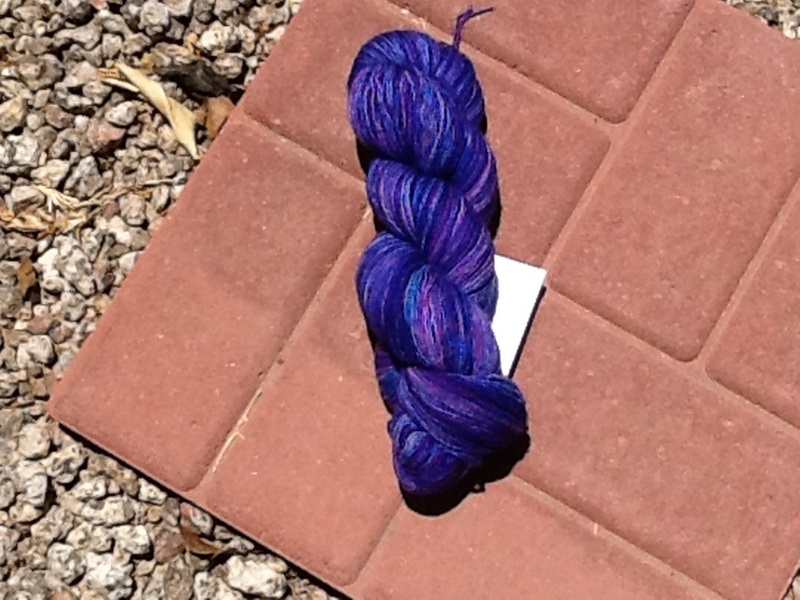 This was my first pick for yarn: Unfortunately, it is laceweight, a detail that I missed in my rush to order online. The pattern calls for sport weight! So I ordered some more yarn in the recommended Zitron Unisono, hopefully it will be here on Friday. I though about sending this stuff back, but then I checked my Ravelry queue and noticed a lace shawl pattern called “Pretty as a Peacock.” I am conveniently ignoring the fact that I have a half-finished lace shawl in a bag in the closet, which was started about 4 years ago! SOMEDAY I will be ready with yarn and pattern, LOL. I hope you are enjoying summer. My daughter and her friend are picnicking on the front porch with ice packs and a squirt bottle to stay cool. Such is life in Phoenix…we may hit 120 this weekend, yoowza. Thank goodness for air conditioning!